When Amanda Roome traipses through the brush and woods, she could find as many as 20 ticks clinging to her clothes. While other people will sweep aside these arachnids only to crush them, the 27-year-old New Jersey native carefully removes the ticks, saving the tiny creatures for further examination. As a biological anthropology doctoral student, she totes them back to her Binghamton University laboratory for further study, trying determine whether they are carrying bacteria, pathogens or viruses that can be debilitating if transferred to humans. "Ticks reproduce pretty quickly," she said. "Even if you have a 90 percent mortality rate, the population is still growing." Such is the nature of the creature that causes Lyme disease, the increasingly prevalent affliction affecting thousands of people nationwide, particularly across the Northeast. In the Southern Tier alone, the number of Lyme disease cases has skyrocketed over the past several years, according to data collected by the state Department of Health. Those are the cases that are reported. Hundreds of others go unreported. Lyme disease symptoms mimic so many other infirmities. "Lyme is also called the great imitator because so many of the symptoms are so typical of other illnesses," Roome said, adding that it is often mistaken for a cold or the flu, or even arthritis. Symptoms also include muscle fatigue, aches and other generalized pain. 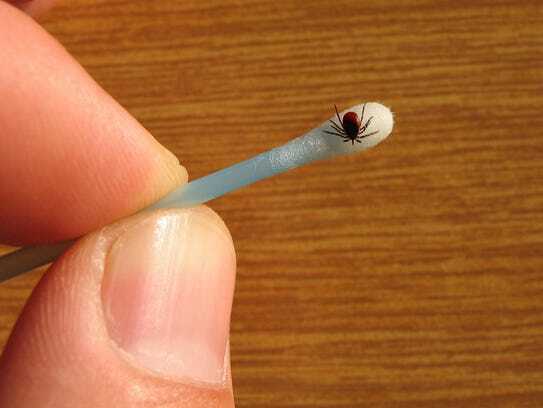 Blood tests can confirm the presence of Lyme disease. Those tests on average cost about $230, plus the fee for the doctor's visit. Lyme disease cases are most prevalent in Tompkins and Schuyler counties, but they are growing in Broome, Chemung, Tioga and Steuben counties, too. In the six-county area of the Southern Tier that Roome examines, about one-third of the ticks carry Lyme disease. Tick warnings, once rarely seen in the Tier, are now common in popular public gathering spots such as parks and hiking trails. As the habitat for the natural predators is eliminated, the ticks are getting a free and unencumbered ride well beyond the areas where they were first discovered. The first case of Lyme disease was detected in — where else — Lyme, Connecticut, some 40 years ago. By clinging to deer, birds and rodents, these disease-carrying ticks have managed to be dispersed throughout the Northeast, making a walk through the woods an exercise in vigilance. People need to be guarded not only in the dense foliage, but by doing such mundane tasks as gardening or virtually any outdoor activity, Roome suggests. Nationwide, Connecticut still has a high prevalence of Lyme disease among its residents, but Maine and Vermont have emerged as the leader on a per-capita basis, based on data collected by the Centers for Disease Control and Prevention in Atlanta. Not unexpectedly, neighboring states also seeing large incidences of Lyme disease are Massachusetts and Rhode Island. Pennsylvania, too, has not been immune to the disease. Making matters worse, ticks bites, because of their size, often go undetected unless a rash develops. An infection could go undetected until the first symptoms develop up to four weeks after the initial bite. "There is a pretty small window for detection," Roome said. When diagnosed, Lyme disease is treated with antibiotics. Unlike the long-lasting flea and tick collars that appear to be effective on dogs, no such device is available for humans. But an effective treatment is available in many retail outlets — Permethrin, sold under the brand name Nix, among others. Deet, the preferred protection against mosquitoes, is ineffective for ticks. Permithrin is sprayed on clothes for protection, not directly on the skin. Roome said it is effective in killing ticks. And if anyone should know from experience how to protect yourself from Lyme disease-carrying ticks, it is Roome, who has devoted the past several years researching ticks. Also, wearing long pants tucked into your socks, long-sleeve shirts and hats will provide another level of protection from ticks. "They're kind of like cockroaches." Roome said. "They can survive anything," even a run through a washing machine.